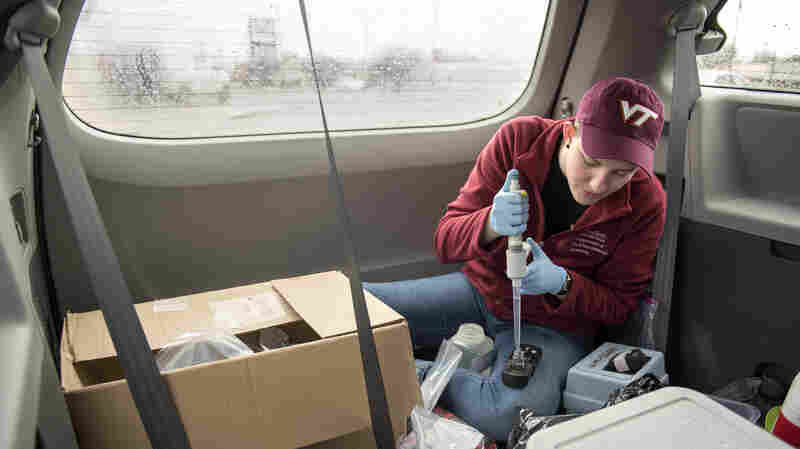 Flint Residents Tired Of Talk And Tests, Eager For Solution A group of Virginia Tech researchers exposed the drinking water contamination in Flint, Mich., last summer. Now, they are back to retest the waters — and determine if the water is still dangerous. 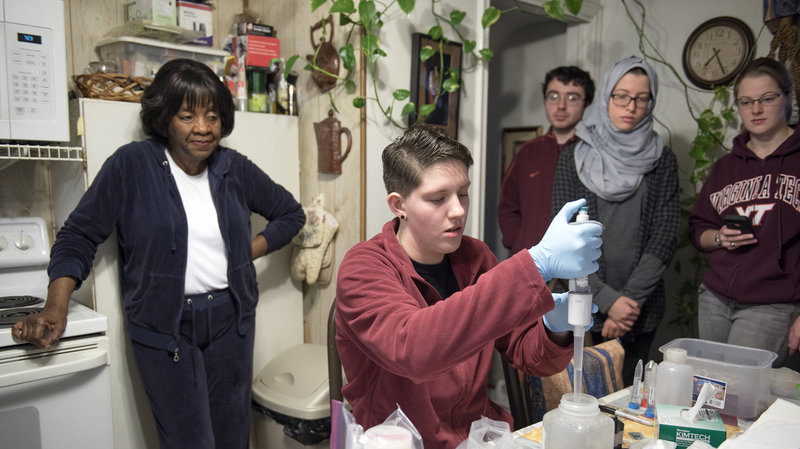 Virginia Tech students from professor Marc Edwards' lab and other student volunteers work on a second round of water testing for lead contamination in Elnora Carthan's home in Flint, Mich. Maggie Carolan is working with samples at the table. Residents in Flint, Mich., are still living in a state of emergency, waiting for answers about the safety of their water. After almost two years of bad drinking water, it can be hard for them to trust researchers and officials – except for a group of independent researchers from Virginia Tech who exposed the problem last summer. "So we trust them. We don't trust nobody else," says Bishop Bernadel Jefferson, a resident of Flint. The researchers, led by Virginia Tech professor Marc Edwards, returned to the city last week to retest the water — performing the only test that compares results from last summer to today. 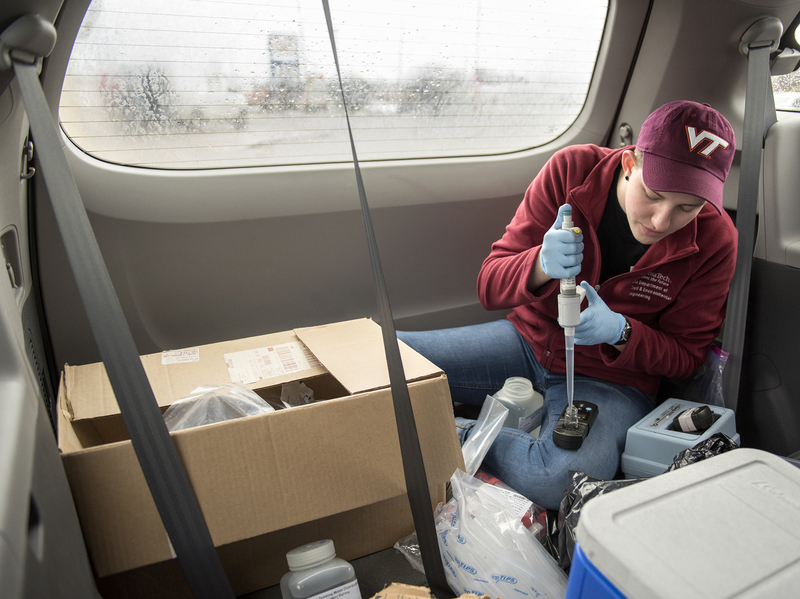 Maggie Carolan, part of Virginia Tech professor Marc Edwards' team, collects water samples and processes them in the back of their van in Flint. The city switched back to treated water from Lake Huron last October. To determine if the situation has improved, they needed testing. Everyone — including state and federal regulators — is waiting for what the Virginia Tech team finds. Pamela Mayes says her water had lower lead levels, but she still doesn't trust it. She and her husband cook and wash dishes using bottled water. They had bought a house in Flint and planned to stay and retire in it. "But now we don't know what we're going to do, you know?" she says. "I can't live like this for a very long time." The team is made up of Flint residents and Virginia Tech students on spring break. They're making phone calls urging people to pick up and drop off their water testing kits. They then box up those kits for testing. Many people in the city are tired of all this talk about the water — they just want it fixed. Anurag Mantha, a graduate student with the Virginia Tech team, says there are a few people who say they are done with all this testing. "People have lost hope in the city, so when we call them, they're like, 'I don't want to do anything with this water business anymore.' Some people are very welcoming, they're like, 'Oh, Virginia Tech, definitely, we'll test our water for you. So we are getting mixed responses," Mantha says. 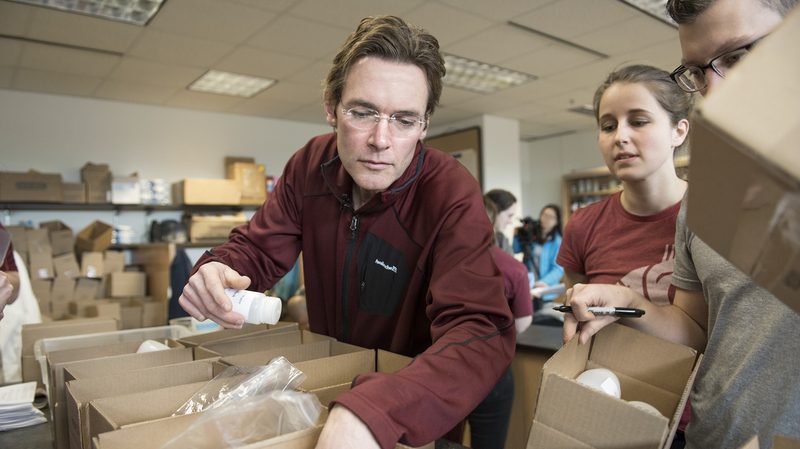 Marc Edwards and his student team assemble water test kits that will be sent to Flint, Mich., for residents to test their water for lead. They tested 269 homes last summer and their goal is to get at least 100 of these retested. The broader goal, though, is to get things back to normal in Flint. But health experts say there's no safe level of lead. The current federal action level in drinking water is 15 parts per billion. Virginia Tech's random sampling last year found that Flint was 10 parts per billion over that action level. Edwards says he does expect these new tests to show lead levels are dropping in the city. "We want Flint to at least meet the same lousy standard that every other city in United States is," he says. "So in order to meet that, there is really three, I think, results that people are waiting for." He's watching his own test and two from the state. Officials say they hope to finally have some answers for the people in Flint in a few weeks.